Opportunities are unlimited for those willing to take the plunge. WHEN young Louis Potomac said goodbye to the Navy in 1945 and headed for his native California, he and his wife set up housekeeping in a reconverted chicken coop. That’s how short of folding money was ex-sailor Potomac. But within a short time, he latched onto an idea which ultimately provided him with two big homes, two big Cadillacs and one great, big bank balance. His idea opens up a whole new avenue of opportunity for other enterprising young men who have an uncontrollable itch for businesses of their own. You might well find your own golden pot at the end of this particular rainbow. Here’s what young Potomac did: Scouting around for a job, he was struck by the fact that all or most of the automobile service stations in his area were suffering from advanced cases of senility. Their equipment was old, didn’t function properly and was causing huge wastes of time and money. Going home one night, a thought suddenly burrowed into his mind: Why not, he told himself, set up an organization to service the service stations? Next day he started making the rounds of wholesalers of equipment and put it on the line: would they finance him in the venture? They would not, thank you, and politely ushered him to the door. But Potomac didn’t stop there—he went directly to the manufacturers, explained his proposition carefully and a few far-sighted ones caught the faint glimmerings of shining profits in the idea of providing a service for replacement and repair of worn-out gas pumps, lift racks, portable welding equipment, and all the other machinery of a modern service station. Potomac got his financing. And in less than a year his service station service was rolling along, doing nearly a six-figure business. Within a short time he sold out, bought another business, sold that, bought another. Each sale netted him thumping profits. Today he’s on top of the heap and it all happened because he got someone to set him up in business. His experience is dramatic proof of one important fact, rarely considered by people who have deep yearnings to be their own boss. It is just this: there are many large organizations in the U. S. which have active programs to put alert, capable young guys in business for themselves. They will provide the know-how, the training, the site, frequently the inventory and sometimes even part of the financing. You may not be able to do it strictly from scratch as Potomac did—some capital is generally needed—but you get a king-size assist to start you rolling on your way. Take the Rayco Manufacturing Co. of Paterson, N. J., the nation’s largest automobile seat cover specialists. Within the past few years, Rayco has set up scores of young men in business from New York City to Tulsa and from Hartford to New Orleans, and they are all netting from $20,000 to $50,000 a year. It all began shortly after the war ended when Joseph Weiss, who had a small fabric business, realized that there were only two antiquated ways of buying seat covers —either the motorist bought ready-made ones that fitted like pop’s hand-me-down pants, or he had them made to measure at astronomical prices.. Why not design and manufacture covers that can be custom-fitted in 20 minutes, he reasoned? Weiss went to work and soon set up two brothers in shops to retail the new product. Then one day, Weiss conceived the idea of creating a chain of franchise seat cover stores and Rayco was on its way. Here’s the setup: A young man is interested in joining the family of store owners. He gets in touch with Rayco, at 220 Straight St., Paterson, N J-> is investigated for his fitness and, if the reports are good, is accepted. Months before his store opens, a corps of specialists goes to work planning it for him. Rayco’s research department studies the potential business in his city, studies traffic patterns and retail business development and determines the best possible location. The real estate department selects the specific spot and negotiates a lease for him, and on terms that few individual retailers can obtain for themselves. Then Rayco’s architects and construction experts take over, supervising and planning all aspects. There’s much more. While his store is being built, he gets a thorough course of training in all phases of the business. It includes everything from selling techniques to the actual installation of seat covers and convertible tops. While this is going on, other experts begin preparing his opening inventory of materials and tools for shipment to his store. The advertising department leaps into action to arrange the blare of opening promotion—the merchandising section arranges for his insurance, showroom furnishings, mailing permits, telephone and the host of incidentals—the installation supervisor screens, hires and trains his crew of workmen. Every detail is planned in advance so that the new businessman steps into his establishment, thoroughly briefed and equipped. Does it work out? Ask the former member of an installation crew who watched others winging on their way, started flirting with the idea and finally decided to take the step. He’s doing fine. Ask the former shoe clerk who dreamed of owning his own business and got his wish; ask the others who used to be dress salesmen and post office clerks. There is even an ex-state trooper who turned in his badge and joined the setup. The extent to which Rayco watches over its flock is eye-opening. It’s not at all uncommon for a dealer’s wife to calL “Uncle Joe Weiss” with a problem. George, she’d say, has been working awfully hard and wants to take a vacation, but there’s nobody qualified to take over. Will Joe send someone down to Texas for ten days or so to take over? Joe’s answer: “Sure. Can you wait-till Friday?” It’s happened frequently. To get started with Rayco you need a substantial sum to cover equipment, basic inventory and working capital. This doesn’t mean that the money must be on hand in cash, at least not all. If your credit and reputation are good, if you can dig up part of the financing yourself, if you can offer sufficient collateral, banks will lend an ear. Take the nationally famous Howard Johnson restaurant chain as another example. The individual spots are operated under a system of franchises by which folks with little restaurant experience can come in and run one of the orange-roofed eating places. And with plenty of assist from the fabulous Mr. Johnson. Less than 20 years ago, young Johnson wanted to establish an outlet to sell a new kind of ice cream he had blended at home himself. A neighbor owned what he considered an ideal piece of property on Cape Cod, but Johnson had neither the money to lease it nor the time to manage it. On his way home to Wollaston, Mass., one day, the franchise idea was born. 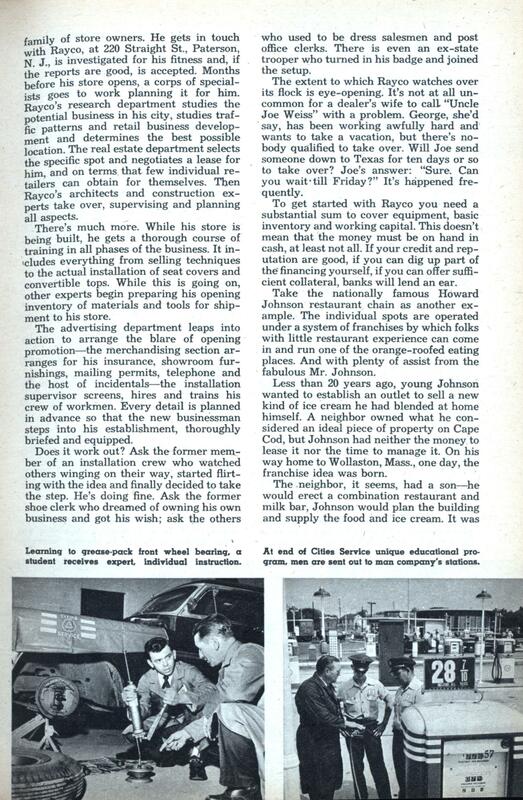 The neighbor, it seems, had a son—he would erect a combination restaurant and milk bar, Johnson would plan the building and supply the food and ice cream. It was the beginning of a business technique which has guided many dozens of persons to successful careers. There is the electrical contractor who ate a hot dog at a Howard Johnson place one day and went away with a comfortable feeling in his stomach and an idea in his noggin. He made inquiries, took the plunge and is happy he did. So did an insurance agent, a bond salesman, a widow and assorted persons from all walks of life. What’s the deal? Johnson provides his “family” with expert supervisory service, making sure all phases of the business are running expertly. In return, they buy all his foods and supplies, from ice cream and hot dogs to napkins and fried clams. Johnson, by the way, doesn’t get a cent of the profits from the individual restaurants, but does right well as manufacturer and jobber. The operator puts down a small fee for the franchise and chooses a location, with the parent company’s approval. The restaurant is then designed by Johnson’s own architects and the operator has it built. How much does the owner stand to earn? Anywhere between $10,000 and $100,000, if past experience is any guide. What will they do? The companies, said Mr. White, will provide the station, the property, the land and the equipment, all of which is leased to the young newcomer. In return, he needs sufficient working capital for his inventory. How do you go about acquiring this “quarter acre” of your own? Write to an Esso Standard Oil Co. division office. In New York, the address is Hutchinson River Parkway, Pelham 65, N. Y.; in Boston, it’s 135 Clarendon St., Boston 17; in New Orleans, it’s 1410 Canal St., New Orleans 16; in Philadelphia, it’s 21 South 12th St., Philadelphia 1. There are others scattered throughout the U. S.
Got a convivial disposition? Like to get around, meet people, have fun? Party selling is a big thing these days and there are a number of big companies who will do plenty to get you started. It’s true that up to now the field has been dominated almost exclusively by women, but a new switch has just become apparent. Husbands and wives have formed teams, gone into it as a full-time business and it’s not unusual for couples now to earn $15,000 annually. The idea is simple. You, as the dealer, ask a friend of yours to have a party in her home. You tell her to invite as many of her friends as she wishes. For acting as hostess, the friend gets a handsome present, perhaps a fine set of steak knives or dishes. When the company gathers, the dealer starts a few games to thaw everyone out and then swings into a demonstration of whatever he is selling. The guests write out their orders for same, the dealer leaves and the party continues. Don’t underestimate this. Last year alone, fully 20,000,000 women attended parties at which pitches were made for products. And it can be done on a shoestring. You can operate right out of your home and the sample merchandise comes to you free from the manufacturer. Does it intrigue you? Want to try it part-time with your wife? 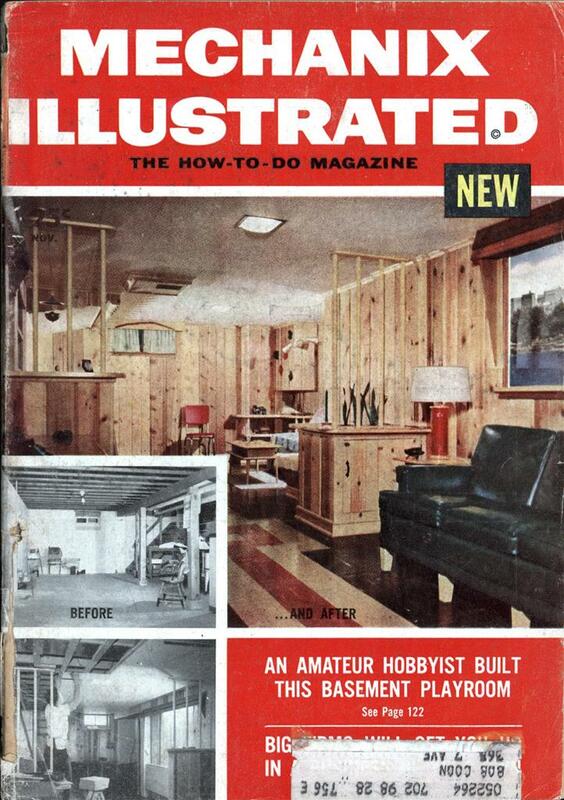 Here, then, are just three firms you can write to for the details: Stanley Home Products, Inc., Westfield, Mass. ; James Company, 263 Main St., West Orange, N. J., and Tupperware Home Parties, Inc., Orlando, Fla.
Did you know that there are a number of firms called venture capital companies whose business it is to provide capital and managerial advice for struggling businesses, who will help finance inventions if they feel they have good commercial possibilities? Consider the case of Calvin D. Mac-Cracken, a young engineer who perfected a new type of jet heater which does not have a chimney, is easy to install and inexpensive to run. He took it to the American Research and Development Corp. in Boston, having heard that this unique organization will not only finance a solid idea but will also supply the business common-sense to put it over commercially. The experts looked over MacCracken’s device, found it good, invested money and today his Jet-Heet, Inc., of Englewood, N. J., is thriving. Consider, also, a Bridgeport businessman, one John Wright, who invented a new kind of power saw and was seeking financial help to develop it commercially. He was steered to the venture capital firm of J. H. Whitney & Co. in New York, which investigated the new saw from all aspects, decided it was a good risk and finally provided financing. The Wright Power Saw & Tool Corp. was thereupon formed in a plant near Bridgeport. Some mighty important things have emerged after these venture capital firms started looking into new ideas. The Whitney company, for example, put a wad of cash into some- thing called Minute Maid, a frozen orange juice concentrate of which you have doubtless heard. Now companies like these are far from being philanthropic agencies—they don’t toss money around like confetti just to help struggling inventors and business men. One official points out that many crackpot applications come in and only about four per cent are worth a long look. But if yours is a sound idea, you might strike oil. Ask your local bank or chamber of commerce for a few names and addresses of venture capital companies. Listen to the heart-warming story of Leon Jolson for one more graphic illustration of how folks can get a boost up the ladder. As recently as 1947, Jolson came to this country as a displaced person after having survived unbelievable horrors in two Nazi concentration camps. He had neither money nor a job. But he did have an idea. Before the war he had been an executive with the Necchi Corp. of Italy, makers of a unique sewing machine which could perform more than 20 sewing jobs without extra attachments. It was a natural for this country, he thought—why couldn’t he establish a distributorship here? But Necchi wasn’t interested in sending any machines on speculation. Things looked bleak until the young immigrant walked into the offices of the United Service for New Americans, an organization dedicated to the job of looking after DPs until they are properly established. He told his story—and received a loan of $2,000. It was still an uphill climb for a long time, but with this initial capital, Jolson was able to launch his new project. Orders came flooding in, and today he heads a corporation which does millions of dollars of business annually. ‘ In appreciation for the break he got, Mr. Jolson now assists ambitious young men in the sewing machine business who wish to establish themselves as independent dealers. Another franchise deal is one offered by the Carvel Dari-Freeze Stores, Inc., the chain of soft ice cream spots which is springing up all along the Atlantic seaboard. It seems to be a tidy proposition for all concerned—in the past seven years several hundred retail outlets have been set up and Carvel has yet to chalk up a failure.